Great news to start 2018, especially if you’re in South Africa and a fan of Chris Cox. He will be starring in ‘The Illusionists – Direct From Broadway’ in Cape Town and Johannesburg in Feb and March 2018. Find out more below or by clicking here. “The Illusionists” has shattered box office records across the globe and continues to dazzle audiences of all ages with a powerful mix of the most outrageous and astonishing acts ever to be seen on stage. The show is packed with thrilling and sophisticated magic of unprecedented proportions. 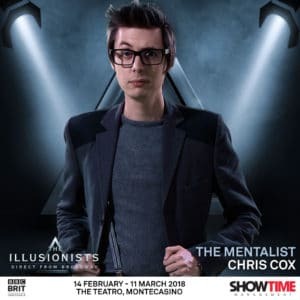 Witness stunning acts of grand illusion, levitation, mindreading, and disappearance in this mind-blowing spectacular that showcases the jaw dropping talents of eight of the most incredible Illusionists including Chris Cox as the The Mentalist. A self-proclaimed “mind reader who can’t read minds”. He is making a big name for himself at home in the United Kingdom and soon in South Africa as a funny, confident and charismatic performer; full of energy, warmth and charm. Chris delivers incredible mind-reading stunts with a silly and mischievous sense of fun that leaves audiences astounded, amazed and thoroughly entertained. Also appearing in the show is award winning New York comedian, Harrison Greenbaum, The Trickster who co-hosted and performed at the official Times Square New Year’s Eve World Wide Webcast in 2010 and 2011 live broadcast to over 250 million viewers around the globe.